Bono was in the Arkansas Democrat-Gazette on Friday (page 5a) announcing a new program called "Red" that will sell products from several companies with the money going to the Global Fund to Fight AIDS, Tuberculosis and Malaria. 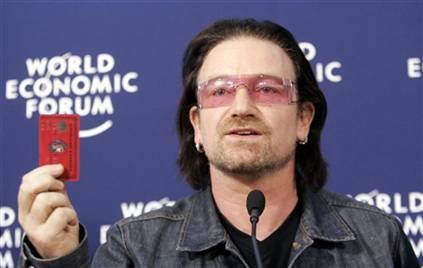 Bono said "We can't do it just with governments alone. We're fighting a fire. The house is buring down. Let's get the water." Kobe Bryant dropped 81 on Toronto Sunday night!